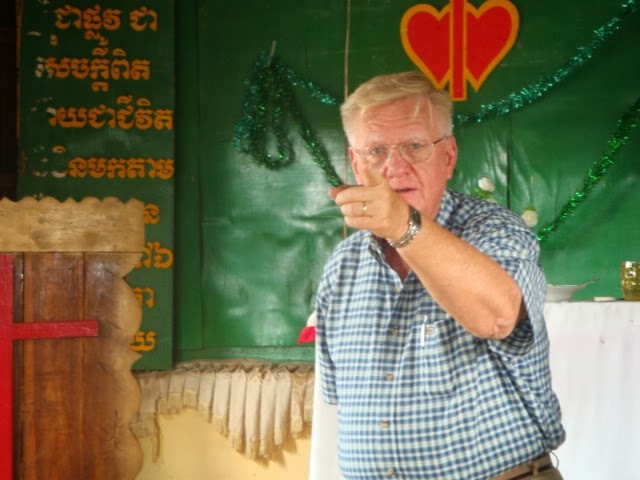 After going through my old video files yesterday, I found a video clip I've taken when Dr. Chuck Roost visited Cambodia in August 2010.
Who is Dr. Chuck Roost? Here is a brief description about Chuck from the International Steward's website. "The founder and visionary behind International Steward, Chuck has served International Steward faithfully and passionately since the organization was founded in 1999. His retirement was announced in May of 2013, at which that point he moved into a new role as Founder Emeritus. This honorary position reflects the appreciation and recognition by the Board of Directors for Chuck's vision in establishing this ministry. Chuck is a highly skilled teacher, writer, and pastor, and his passion for stewardship and sustainability defines his legacy at International Steward." Although the video below was taken in 2010, Chuck has been coming to Cambodia since 1995 and his recent trip here was last week. The video was taken in a small rural Church in Kampong Chnang province. In this video, Dr. Chuck Roost tells a story of poor believers in Uganda who thought they have nothing to give but were able to build a church by planting tomatoes and donating the sales to the church. It is a powerful story that challenges church members not only in the area of giving but on stewardship as a whole. Watch this video below to listen on the rest of the story. Pastor Tor Rasmey did the translation.